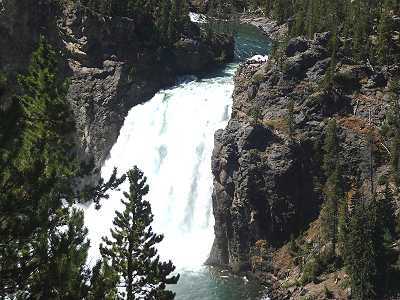 CIf you choose to cruise Lake Yellowstone, you are located in the middle of the best known National Park in the US. 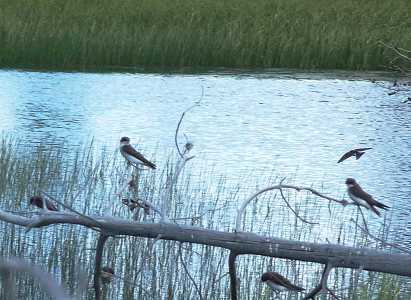 The opportunities to also see and enjoy the features of the park ashore beckon and are rewarding. You truly will be living in the best of both worlds -- afloat and ashore. CLife has its transitions -- sometimes abrupt and sometimes gentle. Bridge Bay Marina allows a gentle change from life ashore to life afloat. The slips come with electricity and water, and a small store and friendly rangers are nearby. 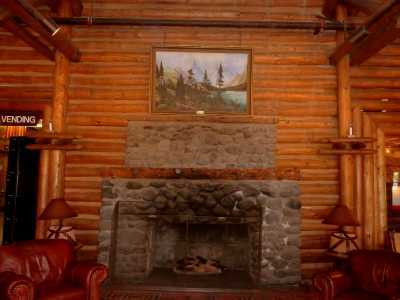 It is a marvelous 'home' between days on the lake and days ashore, and at a reasonable expense. 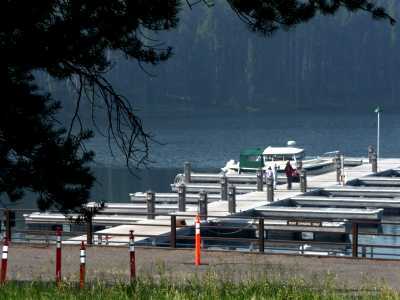 CThis marina is the most popular access area for motorized boats and is literally steps from the Bridge Bay Campground on the lakes northwest side. 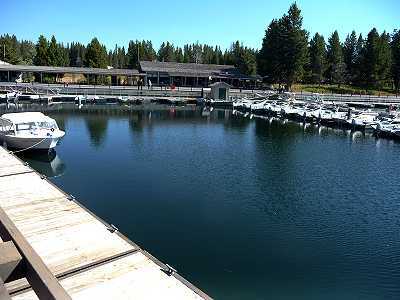 The marina has an excellent multilane launch ramp, gas dock, fish cleaning station, and has mechanics available to provide boat repairs. 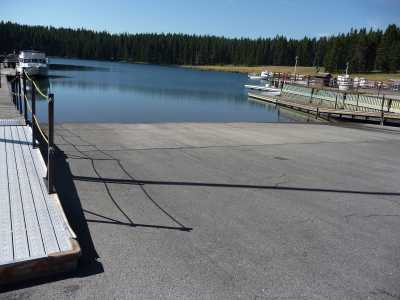 An area in the parking lot is set aside for short-term boat trailer parking. 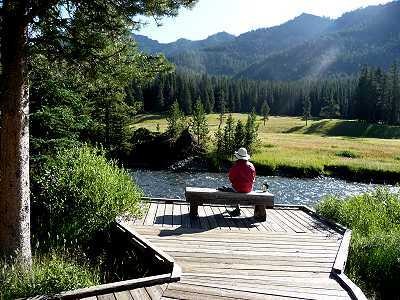 It only lacks showers, that are available a few miles away at Fishing Bridge Campground. 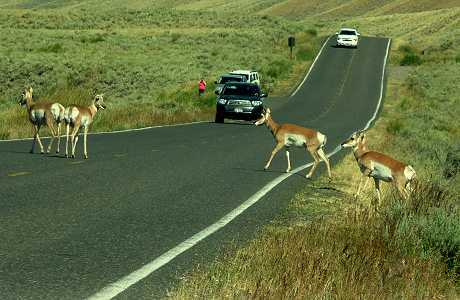 Auto mechanics are also found at Fishing Bridge, and were used by one of our friends at the C-Dory Yellowstone Gathering. 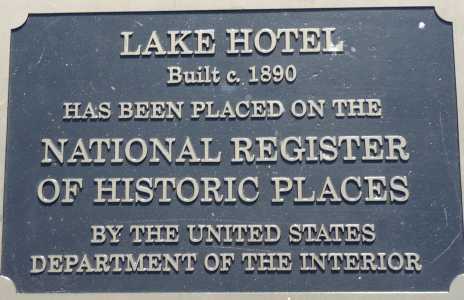 COne of the distinctive features of the lake, and seen from many locations, is the easily recognized bright-yellow Lake Hotel, which opened for guests in 1891 and predates the Old Faithful Inn. 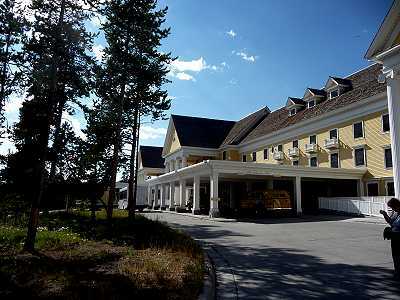 There is a tour of the hotel, or if you wish, just wander the hotel. 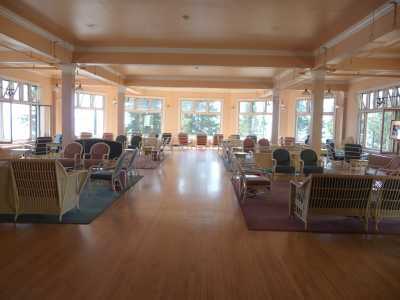 There is a marvelous lounge overlooking the lake, a gift shop, a bar and an excellent (but somewhat pricey) restaurant. 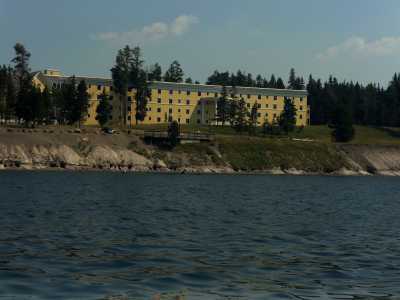 CIn the early years of visitation of Yellowstone, only the wealthy could afford the 'hotel tour.' The less affluent hired local guides and camped out. 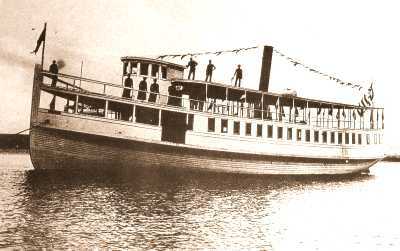 In 1870, a Bozeman, MT school teacher William Wallace Wylie gave his first tour of Yellowstone in this way. He so enjoyed it that he decided to make accomodating tourists his career. In 1893, Wylie was given a license to operate camps around the park -- these were tents, with a bright colorful candy-striped appearance, with wooden bases and one large tent for dining. CHis Wylie Permanent Camping Company did a great business catering to the less affluent or more adventurous. 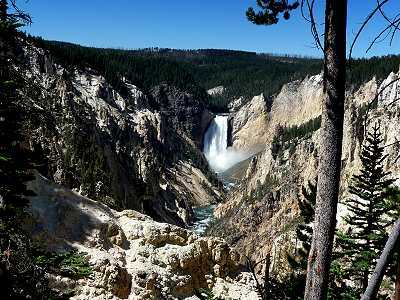 In 1916, all the camping companies merged into one, resulting in the Yellowstone Park Camping Company. 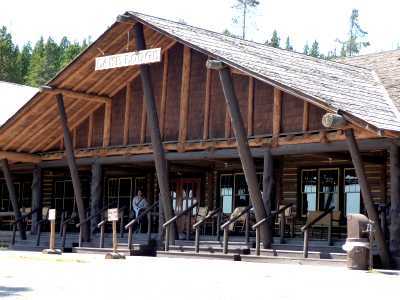 Bozeman architect Fred Willson designed a charming log structure for the dining area and lobby of the camp. Additions were made to the structure and by 1926 the building we see today was completed. 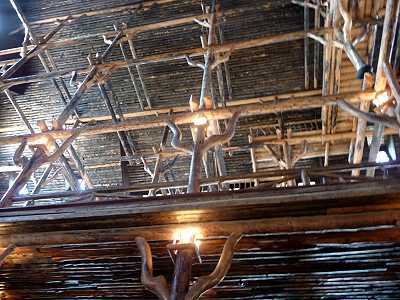 The tent-cabins were then modified into hard-sided structures and over 250 surrounded the Lodge. Today, 186 modernized cabins remain. 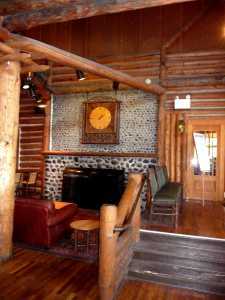 This Lodge is our personal favorite place to relax, dine, and rock on the porch watching bison graze on the lakeshore before the panorama of Lake Yellowstone and the Absaroka Range. 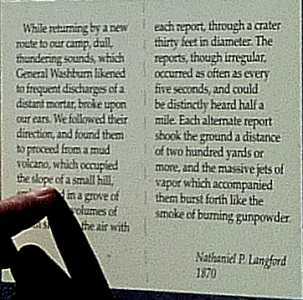 CExplorers, in 1870, stood in awe before the Mud Volcano as it blasted mud into the treetops, shaking the ground with every eruption. 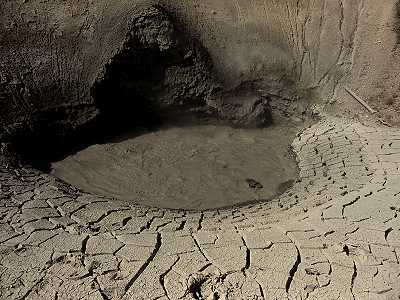 Two years later it was merely a bubbling hot pool of mud -- the pressure was released in those blasts and it had blown itself almost into extinction. 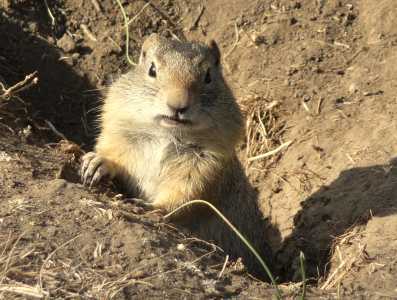 C"Long ago, Daw-Kee, or God, summoned all the tribes together to a desolate, barren land to perform a dangerous task. He told them that the surrounding countryside would be given as a homeland to whichever tribe provided a volunteer who would jump into the Dragon's Mouth. Only a young Kiowa man stepped forward and plunged himself into the boiling surging cauldron. Becoming disoriented from the searing heat and being battered against its walls, the young man stopped struggling and relaxed, resigned himself to death. Instead his body floated to the surface of the cauldron where his fellow tribespeople lifted him into a landscape now transformed into a beautiful and abundant homeland for the Kiowas. The Kiowas believe that by the young mans act of faith, they hold the place closest to Daw-Kee's heart." - Told by S.T. to Sherman Chaddlesone, a Kiowa tribal member. 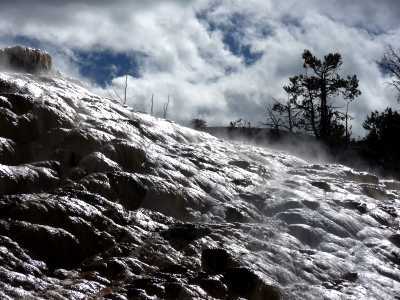 CMany of the thermal features in Yellowstone stink - like rotten eggs! Hydrogen sulfide gas is the source of the odor and rises from deep in the mantle. A whole host of microorganisms, the thermophiles (heat-lovers), 'eat' this gas and use it as an energy source. 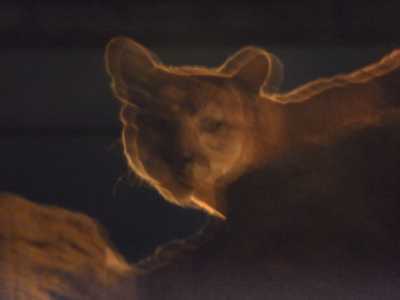 Their life processes turn the gas into sulfuric acid. 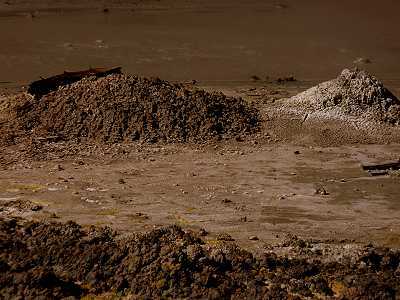 This acidic water then chemically reacts with the surrounding rock, dissolving many chemicals and breaking down the solid rock into small particles that then comprise mud. 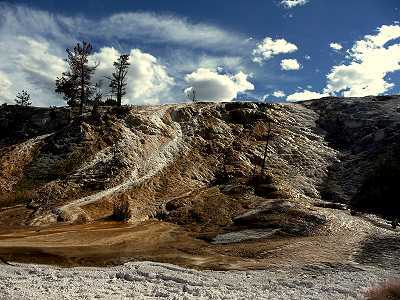 Some of the yellow color seen around the pools is sulfur; some is rusted iron in the mud; some are 'forests' of thermophiles. Iron and sulfur, mixing, creates iron sulfides that reveal themselves as black or gray swirls in the mud. 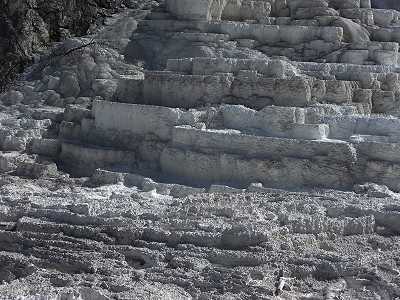 CBillions of thermophiles of many varieties thrive in these hot springs, giving a variety of color to the travertine (limestone) beds. Some live on the sulfur and some photosynthesize their food from sunlight. 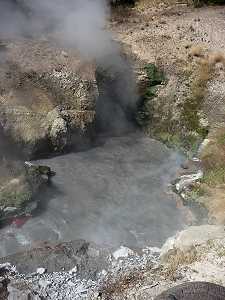 Each has its preference of temperature, of sun or shade, of sulfur or pure water, or of still pools or swirling rapids. 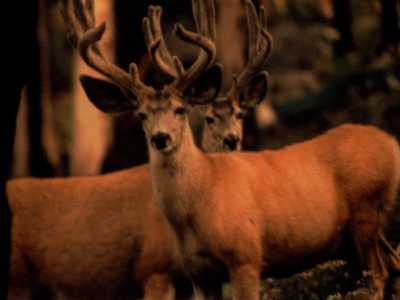 Together they comprise a forest as rich and diverse as that found in the basin of the Amazon River. 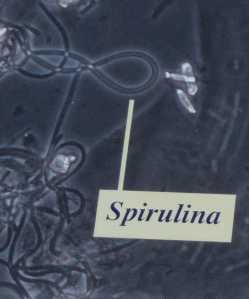 CScientists studies these thermophiles to understand the possibility of life on other planets or the early life forms on Earth billions of years ago. 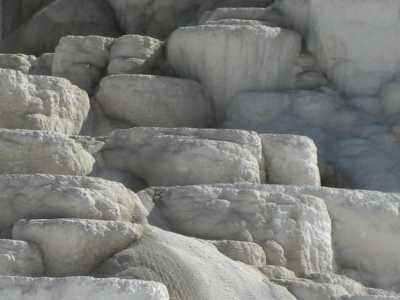 CThere are many thermal areas, throughout Yellowstone. 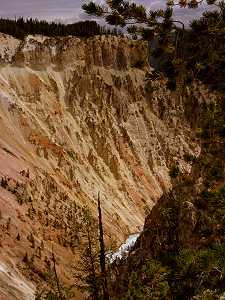 Entire books are dedicated to the Yellowstone Experience.Our purpose here is not to describe each, but to show some photos to illustrate the great variety of experiences one can share in this magical place. 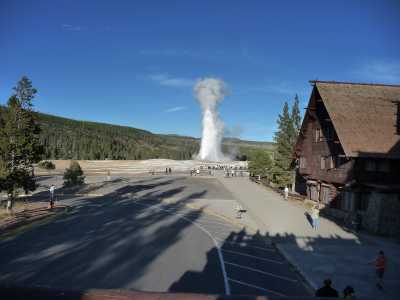 CThis, most famous of geysers, draws a crowd for every daytime eruption. The eruption lasts for anywhere between a minute and a half and five minutes. It averages ninety minutes between eruptions, and the time has been lengthening due to earthquake changes in its plumbing. The height of the column of hot water varies from one hundred six feet to over one hundred eighty, with an average of about 130 feet. 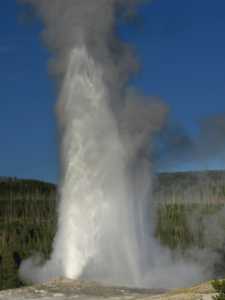 It erupts between 3.700 to 8,400 gallons of 204F degrees temperature. 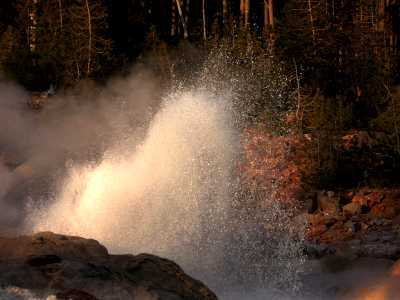 C It is termed a cone eruption, a narrow column of water blasting from a narrow orifice. 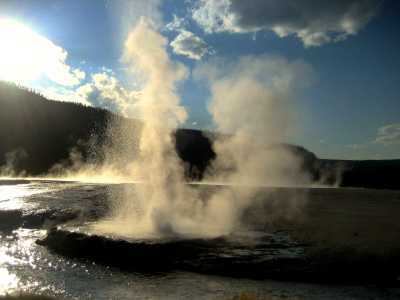 Fountain geysers erupt in a broad column and in several directions. 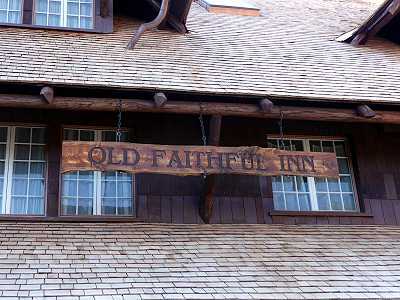 CWhile visiting Old Faithful, be sure to visit the Inn -- the architecture and ambience is magnificent. My first visit was as a five-year-old and I still vividly remember our stay. 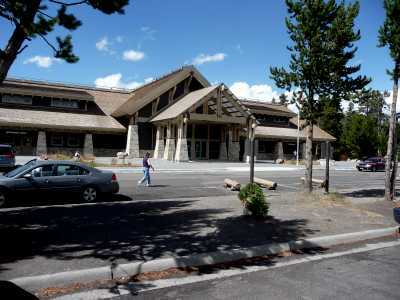 CThis is the newest and most complete visitor center in the Park. 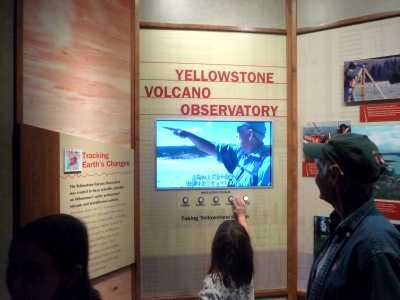 The Yellowstone Volcano observatory is here and there is an excellent visitor center. This is a 'must' stop, particularly for the younger family members. 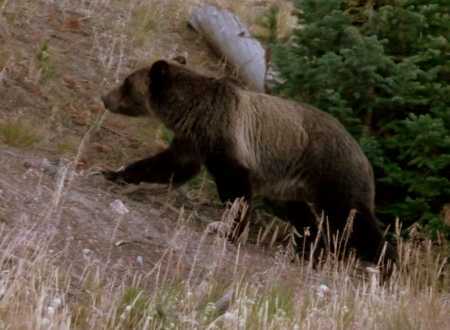 CBears are often seen in the park, usually at a distance, although while staying at the marina grizzly bears, on several occasions, 'cruised through' the nearby campground. 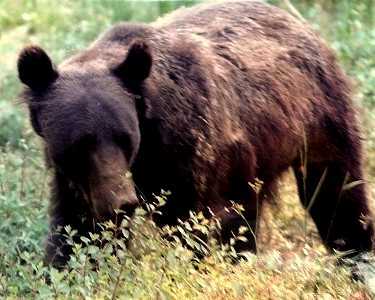 There are two species of bears in the Park -Grizzly and Black. 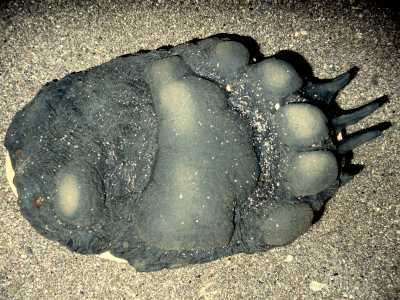 They can be distinguished by the fact that Griz have a large shoulder hump, a short dished face profile, and short rounded ears.Blackies have no shoulder hump, a straight face, and tall ears.EARS - Black Bear tracks - a line drawn under the big toe across the top of the pad runs through the top half of the little toe and through or below the bottom half of little toes on grizzly tracks. CIt has been determined that some of the bison in the park have the bovine disease, brucellosis, that causes disruption in birthing. 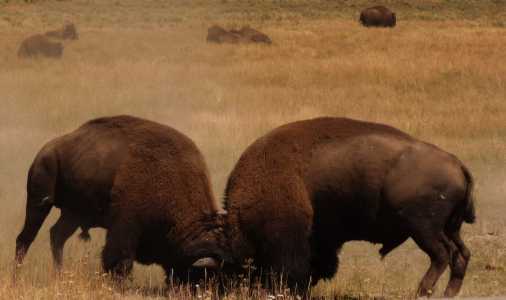 The disease could perhaps be spread to cattle, so local ranchers are concerned about bison leaving the confines of the Park where they might intermingle and infect cattle. 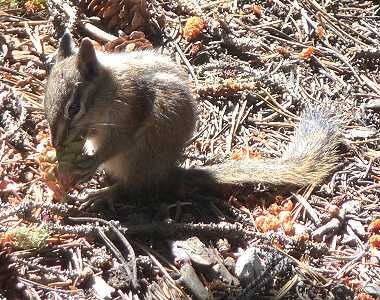 The Park Service has a vaccination program to help control the disease. 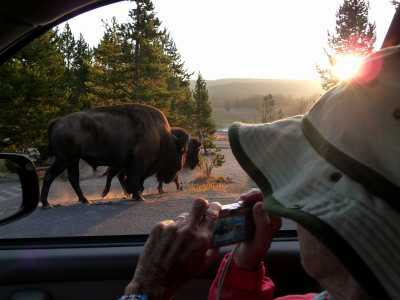 The state allows a bison hunt on public lands adjacent to the Park to control the numbers of bison that leave the Park. 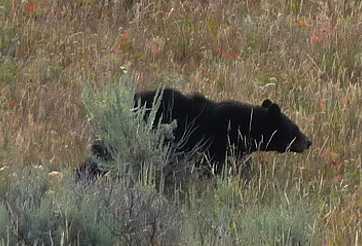 Both the Nez Perce and Confederated Salish-Kootenai people have a treaty right to hunt bison outside the Park. Management plans continue to evolve. 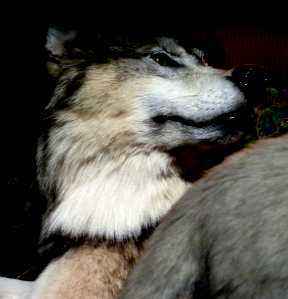 CWolves, extinct in the Park, were reestablished in 1995. 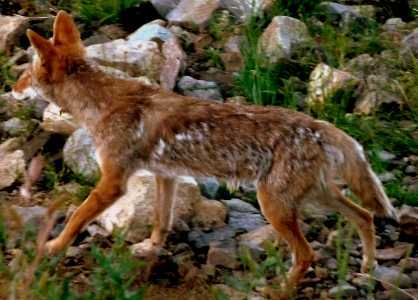 By January, 2008, there were 11 identified packs with 171 individuals. 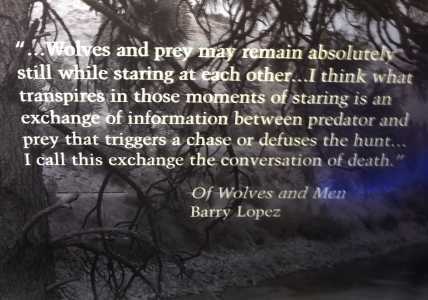 There are thought to be 500 wolves in the Greater Yellowstone ecosystem. 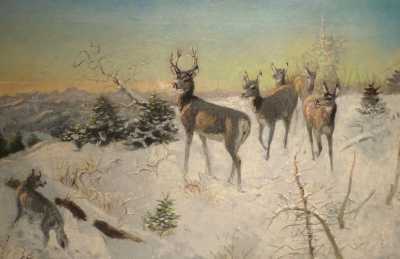 In the winter, wolves largely prey on Elk and smaller mammals. 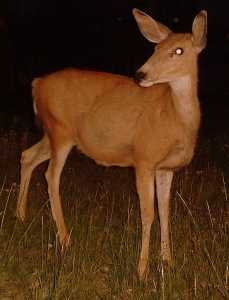 In summer, deer and bison are sometimes killed and eaten. 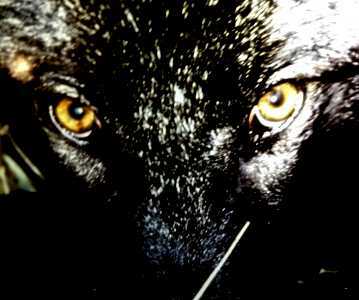 A wolf stomach contains about 20 pounds of meat, so a pack can soon decimate a carcass. Within two minutes of killing prey, ravens are usually on the kill looking for tidbits and remnants. 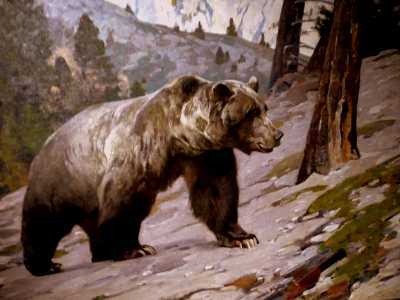 An adult grizzly bear will often run a pack off their kill. Wolves are no longer on the Endangered Species list. 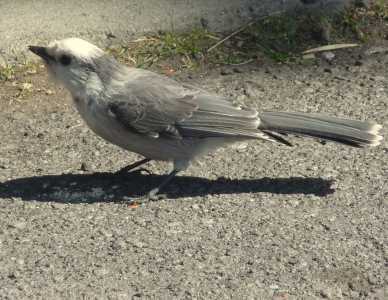 CThese little fellows are everywhere, and, along with the Ravens, are perfect scavengers - keeping the Park neat and tidy. 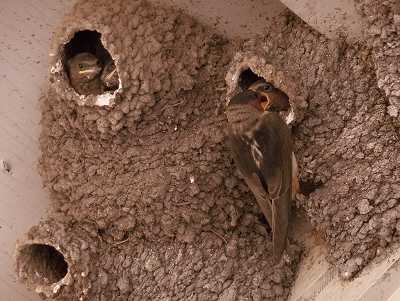 We love to hear them at night. 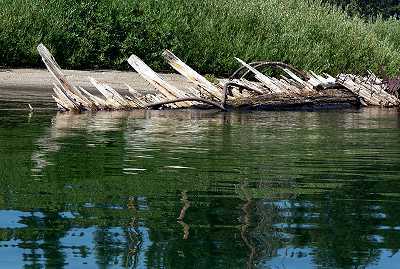 CTA controversy surrounds the arrival method of exotic Lake Trout into Lake Yellowstone. Originall the lake was only home to Cutthroat Trout. The Park Service is attempting to remove the Lake Trout today, but it seems to us to be a hopeless task (and very expensive of our public money). 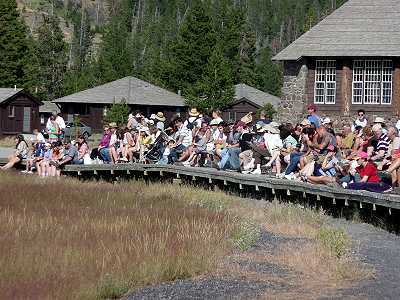 CTThere are many hiking trails in Yellowstone and one for just about everyone. Overnight camping in the backcountry requires a permit from rangers.